View More In Tire & Lug Tools. 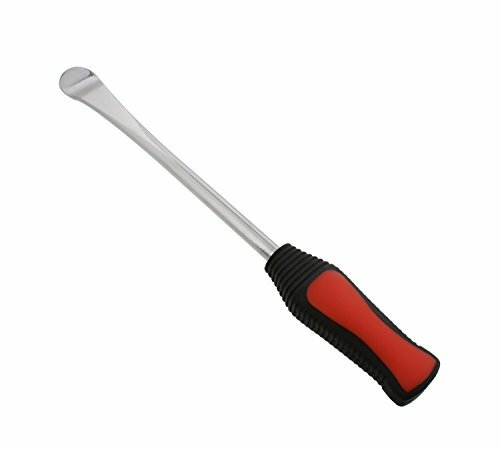 If you have a flat tire and need to install a new one but do not want to sprain your wrist, use the ABN Tire Wheel Rim Repair Metal Spoon Lever Removal Installer Tool. It easily removes motorcycle tires, small agricultural machinery tires, leisure tires, wheelchair and other solid (airless) tires, tubeless BMX mountain bike tires, smaller standard bicycle road and off-road tires, and even the most stubborn downhill tires. Plastic or nylon levers are ineffective, and screwdrivers can damage the wheel and puncture the tire. But, this 11.8 inch (30cm) lever will not damage the tire or injure your hands. The large shovel or spoon-shaped tip holds the tire bead and has smooth edges. Keep this lever with you out on rides and use it in the garage when you are not fixing a tire on the trail. WARNING: This product can expose you to chemicals which is [are] known to the State of California to cause cancer and birth defects or other reproductive harm. For more information go to www.P65Warnings.ca.gov.